Northern Michigan may be a place where many travel to because of our great outdoor activities, but there is more here than a kayak tour a day of skiing. Our arts, history and many types of entertainment mean visitors can spend the day on the golf course and then enjoy fabulous music or theatre. The arts are an important part of the year 'round culture of Northern Michigan but in the summer months, art opportunities galore await visitors and residents. The wonderfully talented dinner theatre hosted by the Young Americans, Bliss Fest, endless opportunities for music and drama at Bay View Music Festival, and Street Musique every Thursday night in Harbor Springs are just some of the offerings available. The galleries of the Crooked Tree Arts Center in Petoskey and the many fabulous art galleries in Northern Michigan provide days and days of art to view. Art has a significant presence in Northern Michigan and many fundraisers such as D'Art for Art focus on the arts. Art fairs? Oh, yes! July 4th boasts a spectacular art fair in downtown Harbor Springs. Petoskey's Art in the Park and arts and crafts fairs bring art lovers from around the state. The Women's Club of Northern Michigan's annual art fair at Nub's Nob is a rite of summer for many. History? Yes! The Little Traverse History Museum and the Harbor Springs History Museum celebrate the many reasons that Northern Michigan has such a rich past. Lumbering, water, Native Americans, railroads, tourists, Chautauquas--just a few of the pieces that make the quilt of history in Northern Michigan. Want more information on the arts, entertainment and history in Northern Michigan? Northern Michigan is rich in natural resources, history, arts, and entertainment. From dawn to dusk, there is much to do here! Learn about Chief Petosega and Ernest Hemingway and the Petoskey Area History at the Little Traverse History Museum. Chief Andrew J. Blackbird was the first postmaster of Harbor Springs. Visit his home and post office at the Andrew J. Blackbird Museum in Harbor Springs. 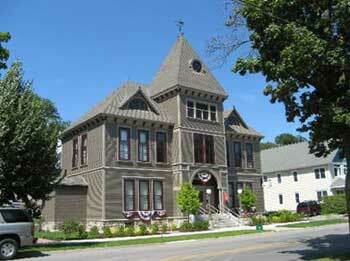 Charlevoix has two museums, The Harsha House and Charlevoix Depot Museum. Castle Farms in Charlevoix has history, museums, and garden tours plus is a spectacular setting for art fairs and celebrations. The Cheboygan Opera House provides music, theatre, and the arts as it has since 1877. Ernest Hemingway loved Northern Michigan and his footsteps can still be traced here as this is Hemingway Country. St. Ignatius Church just outside Good Hart in Middle Village dates back to the 1740's. The Cross in the Woods in Indian River is visited by more than 300,000 visitors each year. Colonial Michilimackinac in Mackinaw City is a reconstructed fort. Daily activities and special events take place throughout the summer months. Harris Gardens at North Central Michigan College, Petoskey, features 22 sculptures in a beautifully landscaped setting.